This morning, I caught a news clip about a You Tube video that recently went viral. It’s a video of a baby girl tearfully responding to the calming sound of her mother’s singing. It is so touching. I then started thinking about how God sings over us with love. I”m thankful that God doesn’t sing over us ‘heartbreak songs,’ as the video shows, but songs of love, grace and hope! In my search for this Bible verse, I came across a devotion so beautifully written by Randy Alcorn. I couldn’t have expressed it any better with my own words. So, here is Randy’s blog entitled, “God Rejoices Over Us with Singing.’ It is my honor to share it with you all. And here is the YouTube video that sparked my search this morning. If you have not yet seen it, enjoy. But grab a box of tissues first. Have you ever had one of those days, that you are so overwhelmed by compassion that you have no other choice but to act upon it- sometimes in the most outrageous ways? You know it’s the Holy Spirit living out through you. You are compelled by the love of God! There’s no other explanation for such behavior! Or take today. I was shopping for some new autumn decorations in a specialty shop and I saw the most gorgeous painting of a cardinal. Well, you may or may not have read my “I Praise You’ poem that mentions the cardinal (I reposted it below in case you missed it), but today I just felt ‘compelled’ to read it out loud to those lady workers right there in the store! I did ask if they wanted to hear it- as if they’re going to say no, right? And I did purchase the painting so they could listen to my poem! Ha ha! 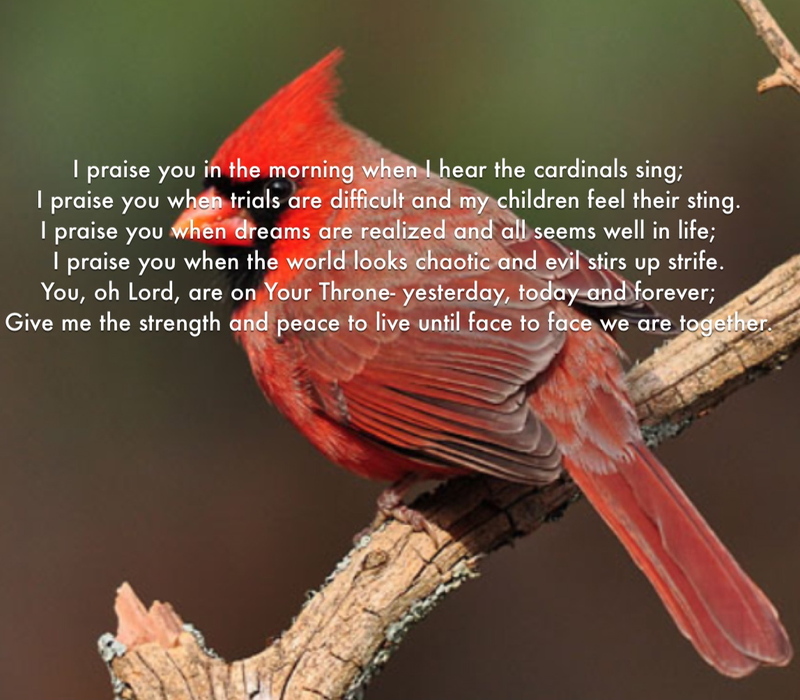 Anyway, the poem is about praising God through all things- more than it is a poem about a cardinal. But it felt amazing to shine a little of heaven into that store. And the lady that was ringing me up quietly thanked me for sharing it. “I’m a Christian, too,” she said. We then further discussed church and other things. You just never know where conversations can lead to when you let the Spirit flow out of you! But I kindly ask one thing of you…. please don’t run the other way when you see me coming. I don’t always feel compelled to hug! But if you need a hug, I will be more than happy to give you one!